With twenty years of experience behind us Broadstreet has established itself within the industry as a reputable and accountable distribution company. We specialise in providing Melbourne’s art and entertainment industry with distribution and promotion services across Melbourne and interstate. Our wide distribution network and experienced staff cater for most means of promotion from programs, posters, brochures and flyers. Our network is constantly expanding with new sites every month as we stay updated with Melbourne’s prime venues, streets and suburbs. 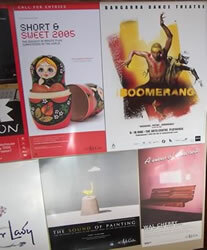 Our stylish poster frames, secured poster walls and perspex and wrought iron stands are placed in key locations to ensure your material is available to appropriate audiences. Our distribution networks include cafes; book, music & fashion stores; cinemas; galleries; educational institutions; libraries; theatres; hotels; backpackers hostels and more. Whilst café and street distribution is our primary business we can also handle more specific advertising such as chalking and targeted personal distribution outside key arts/performance or public spaces with the Melbourne area. All at Broadstreet believe in, and are excited by, Melbourne’s diverse and ever growing arts scene and we look forward to working with you on your next campaign.